The pressure relief valve DB08A is a direct-acting, spring-loaded poppet valve. Its function is to relieve pressure on the system. The spring exerts a force on the poppet and presses it on the valve seat. On the opposite side, the system pressure exerts a force on port 1 of the valve. 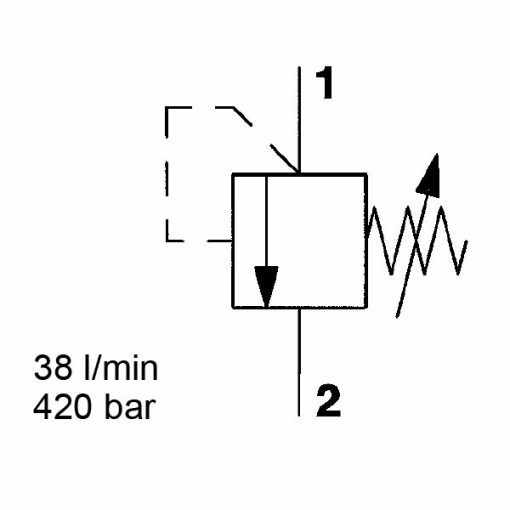 Only if the hydraulic force exceeds the preset spring tension does the valve open and flow is diverted to the tank via port 2. This continues until the system pressure is equal to the spring tension and the valve closes again. Hardened and ground internal valve components to ensure minimal wear and extended service life.